Travelling from Japan, ukiyo-e experts will demonstrate traditional printmaking techniques still practiced today, and introduce the rich history of Japan’s woodblock printing tradition. 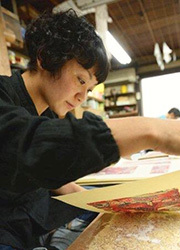 Yukiko Takahashi, a publisher of traditional woodblock prints and the sixth-generation owner of Takahashi atelier, along with woodblock printer Kyoko Hirai will share their expertise. Takahashi will begin the event with a lecture on the history and background of ukiyo-e woodblock prints. This genre of prints gained popularity in the late Edo-period when aristocratic and samurai rule came to an end. As peace flourished, the general public came to enjoy arts and culture. During this time, ukiyo-e primarily functioned as flyers and newsletters, disseminating information about local news, such as kabuki, sumo, travelling, haiku and tanka, sightseeing, and so on. This event is an opportunity for local printmakers, artists, and interested members of the public to see a live ukiyo-e demonstration and discover the intricate tools, such as Japanese rice paper, the disk-shaped pad and wood blocks, used for creating the prints. Please note: The duration of each session may change at the discretion of the presenters. This event will be live streamed via The Japan Foundation, Sydney Facebook Page. Please join us virtually by tuning into our Facebook page from 6pm on 28 Feb. The lecture will start at 6pm while the demonstration will start at 7:15pm. Takahashi’s family have been publishers of traditional woodblock prints since the late 1850s. 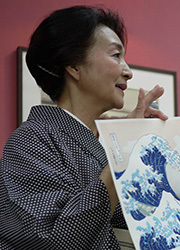 Besides prints created in the ukiyo-e style, she also works on the reproduction of Japanese style paintings and contemporary paintings using traditional woodblock printing techniques. Takahashi is also an educator, frequently lecturing on ukiyo-e at educational institutions in Japan and overseas. Kyoko Hirai graduated from Kyoto Seika University, where she majored in printmaking (hanga), in 1996. After graduation, she trained as an apprentice under Keizo Sato, a master printer (Ukiyo-e Woodblock Printing Guild, Kyoto). She is currently a professional printer specialising in traditional techniques and runs workshops and demonstrations both locally and internationally. Free; Reservations are now full. The event will be live streamed on the official JPF Sydney Facebook page.